The cart-level discount is another marketing tool for ecommerce retailers to employ. It’s an effective method to draw attention and incentivize customers into making a specific purchase. Discounts are based on the customer’s shopping cart and if certain criteria are met. These include predefined items, brands, a preset maximum/minimum order amount, or even if the customer is a return or repeat buyer. Recently, BigCommerce has revamped the way in which cart-level discounts are created. Here, we’ll discuss the individual discount types and then outline the process so that you can incorporate them into your own website. Order X-number units of product Y, get free shipping to specific zones. Order meets or exceeds a set total price, qualifies for free shipping. Buy one, get one free (same item or different item of equal or lesser value). Buy X-number of product A, get Y-number of product B for $ or % off per unit. $ or % off the order subtotal that meets or exceeds a set amount. Multi-tier $ or % off discount to the order subtotal based on order value. Based on quantity: multi-tier discount to qualifying products based on quantity of items ordered within 1 or more categories, subtotal meets or exceeds X-price and qualifies for 1 unit of product Y for $ or % off, subtotal meets or exceeds X-price and qualifies for $ or % off 1 or all products or the least or most expensive item in the cart (IE: Order at least $100, get 25% off the least expensive item in the cart). Get $ or % off all items in one or more qualifying categories. Buy X-number of items from category A, get Y-number of additional units in the same category free (must be equal or lesser value). $ or % discount for repeat customers with registered accounts. Stop After This Rule? – For multi-tier discount rules. 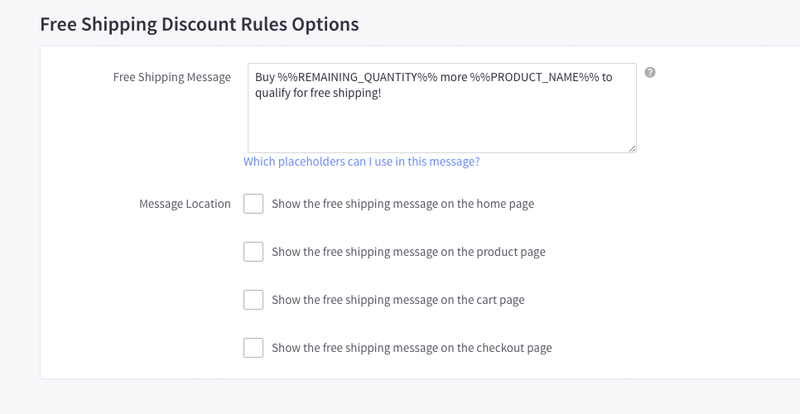 Multiple discount rules can be applied on qualifying orders. These tiers can be arranged in the order in which they will trigger. The rules can be organized by dragging them up or down the list. If Stop After This Rule? is checked on a discount rule, no rules underneath it will trigger. This is to prevent discount rules from unintentional overlapping. Go to Marketing > Create Cart-Level Discount. Click in Rule Name and enter text within the provided field. 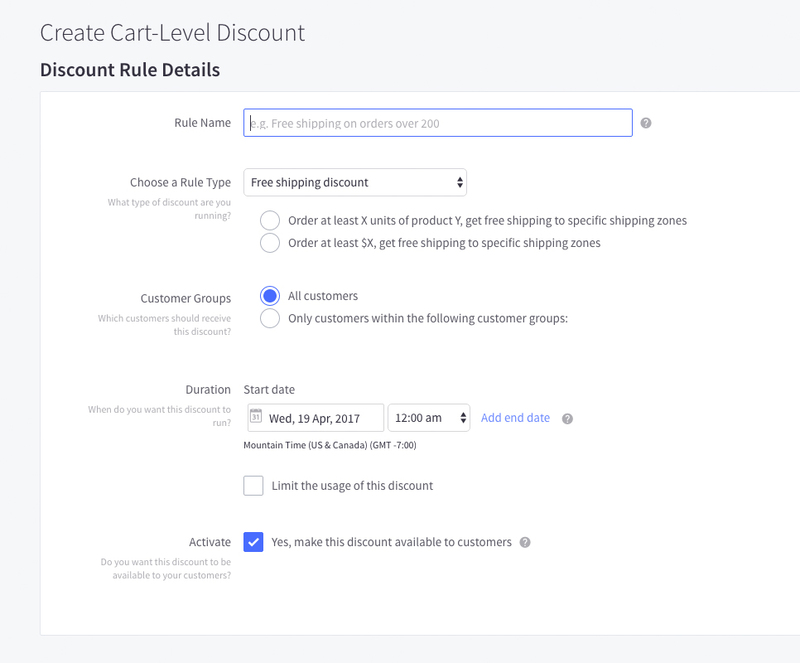 Choose your discount rule from the Choose a Rule Type dropdown menu (the 5 options have already been discussed in the TYPES OF CART-LEVEL DISCOUNTS section). Select the qualifying terms according to the type of discount. Customer Groups: If you’ve created a customer group (or groups), you can limit accessibility to these groups or leave open for all customers. *Duration: Preschedule your discount to run by choosing your start date from the calendar kiosk and the start time from the dropdown. Here, you can also choose to set a specific end date and time. To limit discount usage, check the Limit the usage of this discount and enter the number of times used in the This discount can only be used____ time(s) field. Activate your discount by checking the Activate option. Unchecking this option will disable the discount, but will keep it in your Cart-Level Discount list until you delete it. *NOTE: Should you choose to employ a duration date and time for your discount, dates and times will be in your store’s time zone. Rules only apply to orders placed after the rule was created, regardless of the start date and time. If you change, update, or otherwise modify your store’s time zone/DST settings, the rule will start at its original time but will adjust accordingly (IE: A rule that is scheduled to run at noon and the store’s clock was moved ahead one hour, the rule will now start at 11AM). Any and all discount rules created before the implementation of the start date/time feature will have a default start date of Monday, July 6th at 12AM. You are now ready to start creating your own cart-level discount rules to share with customers who visit your website.